Pond Supplies | Kits | FAQs | Site Map | Product Catalog | Bookmark this site! 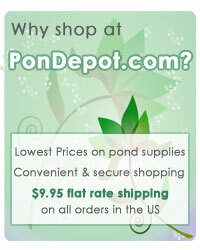 Pondepot.com has been selling high quality Pond Supplies since 1998. After being in business for more than 10 years, our business has grown from a small company into one of the largest online retailers of decorative water-features. Since 1998, we’ve learned that providing great customer service, invaluable knowledge, and a full range of quality products has always been the key to our success, and we only plan to get better. We know that there are few things that compliment your outdoor décor like a water feature – and that’s why we pride ourselves in providing the best products and kits to help you build and implement your own watery center of calm. Our staff consults professional sources on what products are the most efficient and will last the longest. Pond décor is a unique and dynamic trend, and we’re here to bring you the most relevant advances and information in pond supplies, kits, pumps, and accessories. Thanks for visiting Pondepot.com. We hope you find what you need to create and maintain your backyard oasis. Having trouble placing an order online? Have a question about a product? Want to check on the status of your Pond Supplies order? This site reserves the right to cancel any order due to pricing changes with manufacturers, pricing errors, ommissions, mistakes, or for any other reason. While we make every effort to satisfy every customer and fill every order, occasionally we make a mistake on our website regarding pricing, in-stock status of a product, or a description. In these instances customer service will notify you of the mistake and ask if you would like to cancel the order or proceed with the correct pricing or information. If you are not fully satisfied within 14 days of the delivery date, please return your order to us. Call our dedicated customer service at 205-655-7500 and they will assign to you a Return Authorization Number (RAN) which allows us to keep track of the return. The returned product must be in NEW AND UNUSED condition, in the ORIGINAL BOX with all the documentation, parts, and accessories to insure full credit. "New and unused" means sale-able condition, not dirty and not washed. We cannot accept returns for an item with any indications that it has been used. RETURN SHIPPING COSTS ARE YOUR RESPONSIBILITY UNLESS THE MERCHANDISE YOU RECEIVED WAS DAMAGED OR DEFECTIVE. All returns are subject to a 30% restocking fee and must be returned within 2 weeks (14 days) after receiving the item. If you have any questions about the restocking fee as it pertains to your order please call us BEFORE we ship the product as once it leaves the warehouse we have incurred our cost. We love satisfied customers so if you have any questions about this policy, please feel free to contact us via e-mail at admin@Pondepot.com. If your order arrives at your door damaged, broken, or defective, we will either replace the broken parts if possible or ship out a new one completely at our expense. We work hard to make your shopping experience at Pondepot.com an enjoyable one. If you have placed an order and would like to cancel it, please call us at 205-655-7500 within four hours of placing your order to cancel it free of any charges. We will never sell any customer's information to any third party. This is our pledge to you, our customer. Any information gathered on this site will be used only by Pondepot.com. One month after your order is placed, your credit card information is automatically deleted from our database. Your privacy is our first and main concern. We understand that you want to be able to purchase Pond Supplies online and not have to give away your personal information to do so.